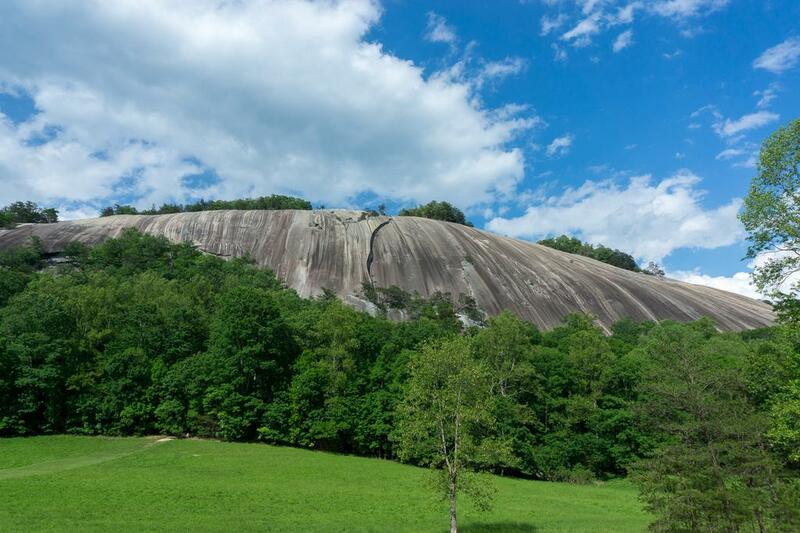 A 600' high slick-rock granite dome rises from a valley just east of the Blue Ridge near Elkin and Wilkesboro, NC, aptly named Stone Mountain - the centerpiece of Stone Mountain State Park. While domes such as this one are not uncommon in the region, Stone Mountain stands apart in the vast amount of exposed rock around its summit. The pluton itself - an igneous rock of hardened lava - covers about 25 square miles. Over time, water and other forces gradually eroded away the softer layers of rock and soil on top of the pluton, leaving behind the hard granite dome we see today. Stone Mountain looms above the meadows near the Hutchinson Homestead area of Stone Mountain State Park, seen here in springtime. 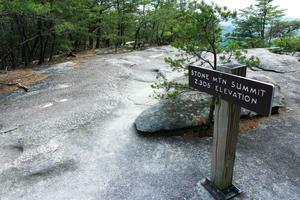 This sign at the summit of Stone Mountain announces the elevation and marks the spot to turn off the trail for a better view on the open rock face. The park is one of the closest mountain recreation areas to the larger towns of Winston-Salem and Greensboro to the east (after Pilot Mountain and Hanging Rock), making it a good choice for a high-country trip if you live in one of those cities. In addition to trails that cross the mountain itself, others wind throughout the park, past scenic rivers, several waterfalls, and up the Blue Ridge to make a connection with the Blue Ridge Parkway at the Devil's Garden overlook. 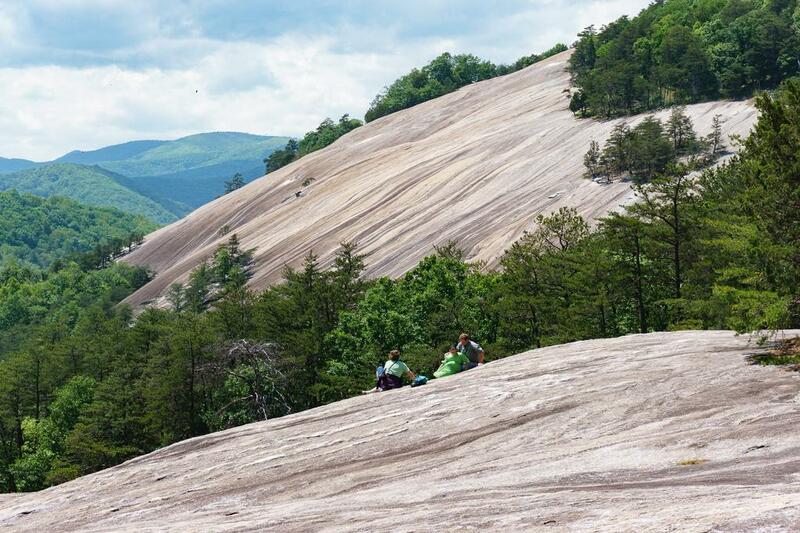 In total, 8 trails totaling 16 miles wait at Stone Mountain State Park, encompassing a variety of difficulties and destinations. Several loop options are available. The main Stone Mountain Loop Trail is the one you'll want to use to access many of the main attractions in the park: the summit, the Hutchinson Homestead, and Stone Mountain Falls. It can be reached from the picnic area via the Connector Trail, the Lower Trailhead Parking Lot on the main park road, or directly from the campground if you're staying there. This panoramic view from the Blue Ridge to the Piedmont can be found at the summit of Stone Mountain. The Cedar Rock Trail is a loop off of the Stone Mountain trail which provides access to a granite outcrop with views to the southeast and of Stone Mountain itself. 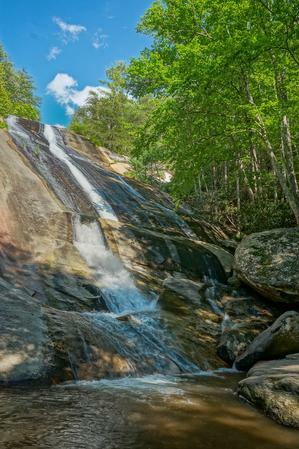 The Wolf Rock and Black Jack trails are some other high-ground trails within that section of the park, while the stream-side Middle Falls/Lower Falls trail follows the creek below Stone Mountain Falls to a series of smaller cascades. 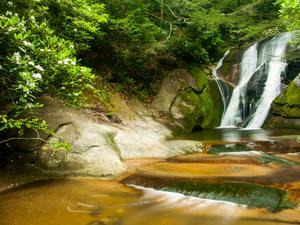 In the northwest section of the park near the Blue Ridge, the Widow's Creek and Mountains to Sea trails provide access to more of the Park's waterfalls and streams. The Mountains to Sea trail in the park, just one segment of a much longer route running all the way from Clingman's Dome in the Great Smoky Mountains to Jockey's Ridge on the Outer Banks, allows hikers to access the Blue Ridge Parkway at the Devil's Garden overlook after a difficult climb of six miles. In the far southern section of the park, the Bridle Loop trail and an out-and-back extension to it are both used primarily by riders on horseback. This is just an overview of the trails that are available. For details on each individual trail accessible from the park, visit the trails page. The Visitor Center, located near the main entrance on John P. Frank Parkway, has general information, restrooms, and the Mountain Culture Exhibit. Widow's Creek Falls is a very short distance from the main park road. A large picnic area is located near the visitor center. There are 75 nice, shaded tables and three large picnic shelters which can be reserved for a fee. There are grills, a water fountain, and restrooms. A short trail from the picnic area connects to the main loop trail, making it a good starting point for your hike if you're planning a meal there. Several historic sites and exhibits are also located in the park. The Hutchinson Homestead, built in the mid 19th-century and restored in 1998, has a log cabin, barn, blacksmith shop, corncrib, meathouse and original furnishings. While the homestead buildings are closed during the week and in the off-season, visitors can still walk the grounds. The Mountain Culture Exhibit is in the Park Office, and tells the story of how independent mountain settlers lived. There's an old-time still, animal pelts, and other artifacts in addition to displays giving visitors the chance to learn about local wildlife. The Garden Creek Baptist Church was established in 1897. It's located on the bank of the East Prong of Roaring River. One of the few original churches in Wilkes County that has not undergone any major repairs or remodeling, the church is now within the boundaries of the State Park and still holds services every Sunday, May through October and on the first Sundays, November through April. Visitors are welcome to walk the grounds when the church is closed. View from an outcropping on the trail below the summit of Stone Mountain toward the summit area and its vast expanse of bare rock. Long before becoming a state park, Stone Mountain was settled by families of English, German, Irish, French and Scotch-Irish descent who built the log homes, farms, mills, churches and schools needed for self-sufficient communities. This human history is represented at the Hutchinson Homestead site below the summit, which offers a fascinating glimpse at what life was like more than a century ago in and around the park. Conservationist and celebrated Winston-Salem resident and businessman R. Philip Hanes, Jr. (1926-2011) bought 1,100 acres to save them from development at the core of what is now the park in the early 1960's. The land was donated to the State to form a new State Park, after which time the state acquired more lands around the core to form the boundaries as they are today. The State Park itself was officially designated in 1969, and the mountain was designated a National Natural Landmark in 1975. The Family Campground contains 90 sites with all the amenities: fire rings, tent pads, picnic tables, and grills. 41 of those sites (in the B loop) also have electric and water hook-ups. Some sites are RV-sized. Comfort stations have drinking water and hot showers. It's open year-round. Reservations are encouraged and can be made on this ReserveUSA page, where you can also see detailed information about each individual site. In addition to the family campground, there are 4 improved Group Campsites which can support up to 25 people each, with a fire pit, grill, and two picnic tables. Water, restrooms and shower facilities are also available. Along the Widow's Creek trail, 6 primitive Backpacking Campsites are available on a first-come basis with a permit obtained from the trailhead parking area. These sites have no facilities. Backcountry camping is only allowed at the designated backpacking sites, and is limited to 6 people per site. The sites are between 1.5 and 3 miles from the trailhead. From the junction of US 21 and NC 268 (CC Camp Rd) in Elkin, NC, take NC 21 N for 9.6 miles to Traphill Rd. Turn left; go 4.4 mi to John P Frank Pkwy. and turn right. It's 3.4 mi to the upper trailhead, on the left.